A home server is the logical conclusion to the growing media libraries that we're starting to amass on our home computers. For those with multiple PCs on a network, having a central point from which to dispense audio and video is sensible; add in simple automated back-up and you've got Windows Home Server. Although available to system builders, you can also buy complete hardware solutions, one being this MediaSmart PC from Hewlett Packard - and it's brilliant. 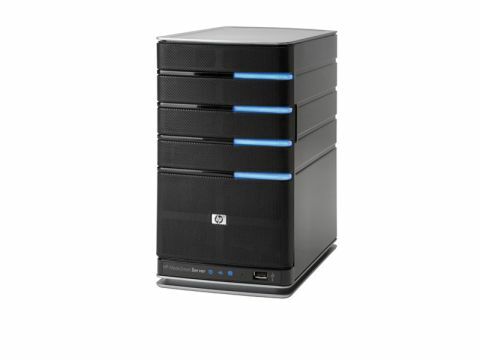 Artfully designed, the small, quiet unit features two 500GB drives, with bays for two more. It's headless (no monitor) and so can be tucked pretty much anywhere you want where there's network access (wired or wireless). It automatically and incrementally backs-up their contents nightly. HP has created a custom interface with icons and it's very intuitive. You don't need IT support to run it. HP has included its own iTunes media application which allows connected users to stream iTunes libraries over the network. If you have extra hard drives lying around, you can add them to the spare bays, from where they can be formatted and appear as part of your overall disk capacity. The MediaSmart's remote access depends on the co-operation of a uPnP modem, and was the only aspect of the package which proved difficult to get up and running.